Billie Jean King is amazing. A role model to everyone from gay rights activists to female equality supporters, this tennis player is well-known all over the world. Born Billie Jean Moffitt, Billie Jean was born on November 22, 1947, and grew up in Long Beach, California. As a child, Billie Jean was surrounded by athletes. Her father, Bill Moffitt, was a firefighter and a sportsman, and her brother, Randy Moffitt, became a pitcher for the San Francisco Giants baseball team. At age 11, Billie Jean fell in love with tennis. She won her first championship at a young age of 14. At the time, tennis was considered a men’s sport: Billie Jean faced many challenges because of this. Out of her 20 Wimbledon titles, Billie Jean won her first, a doubles title, when she was 17, she and 18-year-old teammate Karen Hantze were the youngest team in history to win the tournament. At that point, Billie Jean was ranked fourth in the country. While she was studying History at Los Angeles State College, Billie Jean met law student Larry King. The two were married in 1965. 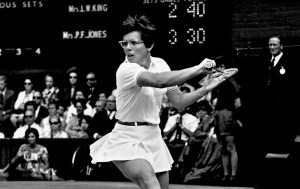 Named “Outstanding Female Athlete of the World in 1967”, Billie Jean continued her reign of tennis in 1968, when she became the first woman to sign a professional contract to tour with a group, which was considered the best at that time. In 1971, Billie Jean became the first woman to win over $100,000 in prize money by playing tennis in a single year. This earned her a phone call from President Richard Nixon. Just one year later, Billie Jean recieved $117,000 when she won the US Open. Although this sum was impressive, the amount was still $15,000 less than the prize of male singles winner, Ilie Nastase. Despite winning the U.S. Open, Billie Jean refused to return the next year unless the women’s prize money total was increased. Thus in 1973, the U.S. Open became the first major tournament in the world to offer equal pay to both genders. In the same year, Billie Jean played in for which she is well-known: the $100,000 prize winner-take-all match against previous Wimbledon champion Bobby Riggs. Many people wondered if beating the 55-year-old Riggs would accomplish anything, but Billie Jean saw things differently. With a live audience of 31,000 and a television audience of 50 million, the pressure was on. The match was to be played best three out of five, but Billie Jean beat Riggs in just three sets. In 1974, Billie Jean became the first female to coach a multi-gender professional team. And a year later, she joined a group that helped establish the World Team Tennis League, the Women’s Professional Softball League, and Women's Sport Magazine. Overall, the list of Billie Jean’s titles is incredible and includes 67 professional wins and 37 amateur titles. She also reached 38 other professional finals and won an astounding sum of prize money totaling $1,966,487. Billie Jean’s final play came in 1983 when at 39-years-old she lost to eighteen-year-old Andrea Jaeger at Wimbledon. However, she did make a cameo appearance sometime later at the Boca Raton tournament where she won winning a doubles match with the 13-year-old Jennifer Capriati. Following her professional tennis career she coached the U.S. Olympic team to gold medals. Today Billie Jean lives in Chicago, Illinois, with her partner Ilana Kloss. She serves as a director for the Women’s Tennis Association. Also, a part of the International Tennis Hall of Fame, and The National Women’s Hall of Fame, Billie Jean is known as one of the greatest female tennis players of all time.